Celebrate Columbus Day on holiday! With our Columbus Day selection of offers, you can find the perfect way to celebrate the years of history and tradition marked by the national holiday. The new SureStay Plus Hotel by Best Western Point Richmond is opening its doors and inviting travelers to experience one of the newest brands of the Best Western family of hotels and resorts. All of the newly renovated, spacious guest rooms have a microwave, refrigerator and an in-room coffee maker. 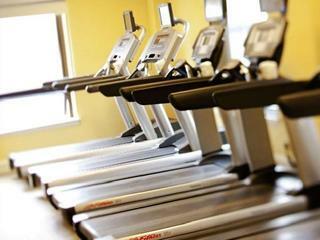 Registered guests also have access to our seasonal outdoor pool, exercise room and a complimentary full hot breakfast buffet. 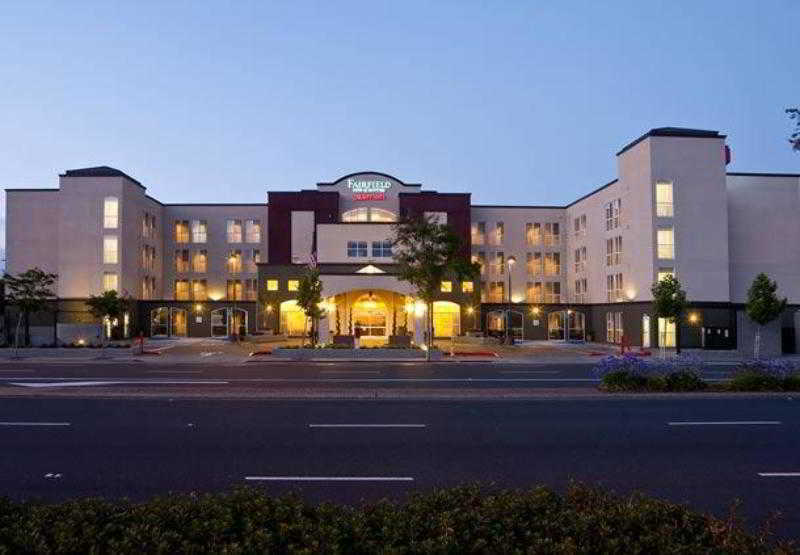 Conveniently located off US Route 101 in California, the hotel is situated among numerous fine dining establishments, world renowned attractions, endless shops and vast business opportunities.The air-conditioned hotel is the newest and most modern hotel in the area. Guests are welcomed into a lobby with a 24-hour check-out service. The hotel features an outdoor heated pool, full service restaurant and bar, room service, complimentary airport shuttle (by request only), indoor hot tub, dry sauna and a gym. There is also over 2600 square feet of meeting space, a business centre. Self Parking available at $17.00 per day/per car.Each of the spacious hotel rooms have quality amenities, including high-speed Internet access, one king-size or two queen-size beds, luxurious new bedding and 32-inch multimedia flat-panel TV with satellite/cable channels. There are some room that has desks available, activity tables and sofa beds. The rooms are also en suite with a shower and a bath. Further standard features include a direct dial telephone, radio, and individually regulated air conditioning and heating. 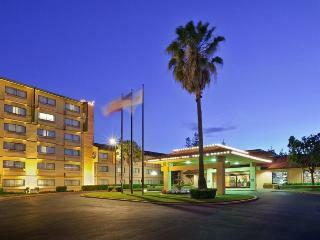 This lovely hotel can be found in Millbrae. The 85 welcoming rooms offer a perfect place to relax at the end of the day. This property was completely refurbished in 2010. Unfortunately, the front desk is not open 24 hours. No pets are allowed on the premises. The hotel may charge a fee for some services. The hotel is conveniently located 4 miles north of San Francisco International Airport and 8 miles south of Downtown San Francisco. The hotel is close to Highways 101, 280, 380, 92. 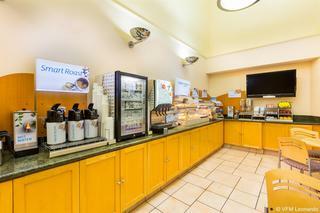 Enjoy a complimentary continental breakfast is served daily from 6:30 AM to 9:30 AM. We provide exceptional customer service along with a 24-hour front desk to ensure your stay is as pleasant and enjoyable can be. The Holiday Inn Express in Pacifica offers oversized rooms with Free High Speed Internet access, microwave and refrigerator, wet bar, in room coffee maker, 27 inch TV's with 80 channels including HBO. 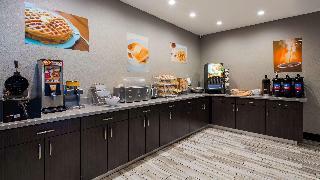 In the morning, enjoy our Free Express Start Deluxe Continental Breakfast in our great room and complementary USA Today newspaper. In the evening have a cup of our Smart Roast coffee on our patio while you watch the sunset. This hotels design gently balances earth, wind, fire and water, from the sophisticated lobby to the guest rooms. The location is perfect in Union Square, surrounded by theatres, fine dining and the best shopping the city has to offer. This air-conditioned San Francisco boutique hotel has 10 floors and 105 rooms. The lobby provides a 24-hour check-out service. The eco-friendly Good Hotel is a unique design hotel using recycled materials in bright, friendly rooms and basing its philosophy on philanthropy. Guests may rent a bicycle for free to explore the city. 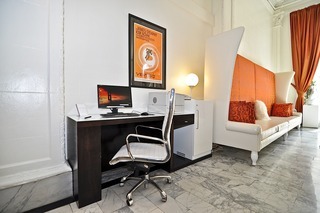 The hotel enjoys a fantastic location in a historic building in the lively SOMA district, South of Market Street, one of San Francisco's most stylish areas with vibrant nightlife and urban shopping. Union Square, Market Street, the Moscone Convention Center, Westfield Shopping Centre and the iconic Cable Cars are within walking distance. This charming establishment offers the ideal accommodation for those travellers eager to explore the vibrant city of San Francisco. 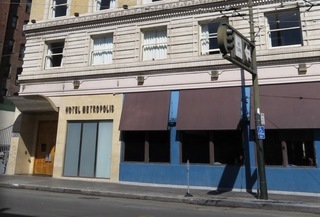 It features a prime situation on Market Street, in the heart of the city, midway between downtown and Castro District. Guests will find themselves close to the Civic Centre and within walking distance from Union Square and the Moscone Convention Centre. Moreover, a lot of shops, restaurants and different entertainment options are to be found in the surrounding area. This enchanting hotel offers two types of completely equipped accommodation units, both featuring complimentary high-speed wireless internet access and services such as microwave and fridge. All guests can take advantage of the free continental breakfast served daily, ideal to kick start the day with a dose of coffee. 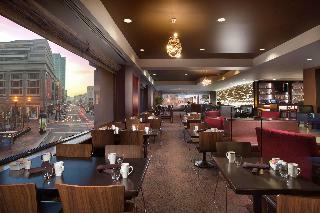 Welcome to the Hilton Parc 55 San Francisco, a luxurious property - just two blocks from Union Square. Warmly appointed for business and leisure, these downtown San Francisco hotel accommodations afford unparalleled access to 'everyone's favorite city.' A one night penalty will apply to departures that occur earlier than the date specified on the original reservation. A daily deposit of $100 will be placed on hold for incidentals to the credit/debit card provided at the time of check-in. Cash or reloadable debit cards will not be accepted to hold deposits at check-in. (subject to change). No name changes allowed. Set in the heart of San Francisco’s stylish South of Market district, Hampton Inn San Francisco Downtown/Convention Center is just moments from the Moscone Convention Center, Union Square and the Financial District. Just two blocks away, you can catch a cable car or a BART train, making it easy to explore Chinatown or visit Fisherman's Wharf and Pier 39. Our downtown San Francisco hotel is within walking distance of many lively bars, popular restaurants, movie theaters and museums. Catch a Broadway show in the nearby Theater District and discover shopping and dining options at the upscale Westfield Shopping Centre.Settle into a comfortable and modern guest room, where you can stay connected with free WiFi at the ergonomic desk and watch movies on the flat-screen TV. After a busy day, sleep soundly in the clean and fresh Hampton bed®. Start your day with an energizing workout in the free, 24-hour fitness center, which features the latest equipment and personal viewing screens. Savor our famous freshly-baked waffles at Hampton's free hot breakfast buffet or grab a free Hampton's On the Run Breakfast Bag to go, Monday through Friday. Enjoy free tea and coffee in our welcoming lobby 24-hours a day, and buy snacks, gifts and sundries in the 24-hour Suite Shop. Take advantage of useful services like printing and faxing in the free 24-hour business center.Friendly service, clean rooms, comfortable surroundings, every time. If you're not satisfied, we don't expect you to pay. That's our commitment and your guarantee. That's 100% Hampton®. 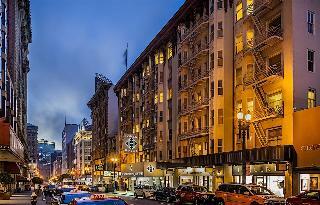 This popular hotel enjoys a great location in San Francisco, lying just a short walking distance away from Union Square. 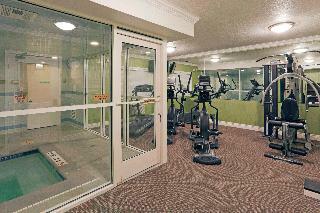 Guests will find themselves within easy access of an abundance of bars, restaurants and entertainment venues. Links to the public transport network are to be found just 100 metres away from the hotel. 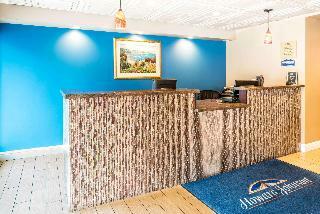 This hotel is nestled amidst the rich history, culture and bustle of the exciting city. Guests are welcomed into the relaxing surroundings of the lobby, where elegance and charm abound. The guest rooms are eloquently designed, and are well equipped with modern amenities. 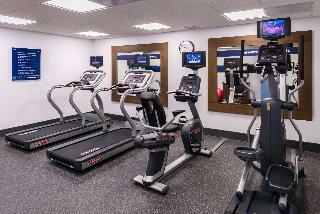 Guests are invited to take advantage of the many facilities and services that the hotel has to offer. Having been the site of Alfred Hitchcock's masterpiece “Vertigo“, this boutique hotel is perfectly located in the centre of San Francisco. 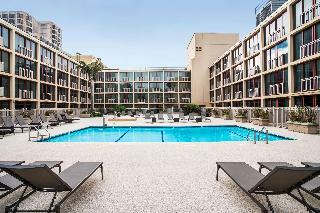 Union Square is only 3 minutes away, Fisherman's Wharf is within walking distance. The non-smoking hotel features 101 rooms, 24-hours reception, concierge service, free WIFI in all areas, business centre, meeting rooms, fitness centre access, laundry service and valet parking. Facilities for disabled guests. Location This magnificent hotel is situated at the top of Nob Hill. Numerous restaurants and bars are to be found in the immediate vicinity (some 50 m) and various shops are roughly 100 m from the hotel. A public transport stop is about 10 m away. This 46-story hotel is home to an outdoor pool, and FedEx Kinko's business centre. Concierge staff can provide assistance with tickets and city tours. Further facilities on offer to guests at this air-conditioned establishment include a lobby with a 24-hour check-out service. The guest rooms at this hotel are appointed with contemporary cherry-wood furnishings and autumn tone fabrics. All rooms come with an en-suite bathroom and are equipped with amenities, carefully selected to guarantee a comfortable and peaceful stay. Individually regulated air conditioning and heating units are provided in all accommodation as standard. Columbus Day marks the anniversary of the discovery of the Americas. Christopher Columbus first arrived in America in October of 1492 and since the late 18th century, the United States and Latin America have been celebrating the anniversary of his arrival with great festivities and a annual federal holiday.